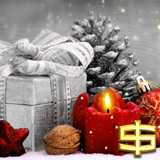 Gamblogger: Slotland's Christmas Gift for Slots Players -- a $15 Free Chip! Slotland's Christmas Gift for Slots Players -- a $15 Free Chip! Slotland has a special Christmas gift for slots players all over the world this week: a free chip to give them a little more play time over the holidays. The $17 free chip (up to $85 for VIP players) can be used to enjoy any of Slotland’s unique games, including the frosty new Ice Crystals. $17 free chip (up to $85 for VIP players) and a choice of deposit bonuses available December 24 – 29, 2017. The wagering requirement is 25X for free chips and max. cash-out is 6X. Valid for all slots and progressive jackpot games. Slotland celebrated its 19th birthday in 2017. It's been quite a year for the unique casino! Nearly twenty new games have been added (there are more than 60 now). In June, Debra J, a stay-at-home-mom, won the casino’s biggest progressive jackpot payout ever when she won $315,124 playing the hunting-themed slot, Open Season. And Bitcoins are now an option for deposits and withdrawals. Slotland’s newest game is the frosty Ice Crystals slot with Trailing Wilds and Premium symbols. Its Wild symbol is a frozen W that expands to include the next row down after each winning spin. Each time it expands, its win multiplier increases. Two “Premium” symbols offer extra big payouts for players that bet more than 200 coins per spin.